Armida Siguion-Reyna turned 79 yesterday, November 4. The veteran singer-actress celebrated the event with a birthday bash last night at Whitespace events venue in Makati City. One of the guests, Gretchen Barretto (inset), was asked to sing for the celebrator. To everyone's surprise, the actress had brought her own pianist to accompany her in singing "Can You Read My Mind?" It may not be her party, but she can bring her own pianist if she wants to. 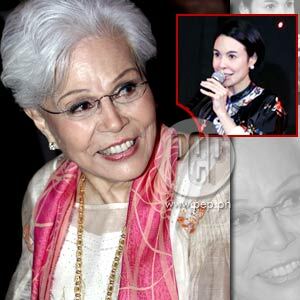 That's exactly what Gretchen Barretto did last night at the 79th birthday bash for one of Philippine cinema's well-loved grand dames, Armida Siguion-Reyna, producer of Barretto's 1993 film, Kailangan Kita. At the Whitespace events venue in Makati where the affair was held last night, November 4, the controversial actress and singer—who arrived with businessman and longtime partner Tony Boy Cojuangco—surprised everyone when she took to the stage in her Oscar dela Renta kimono and sang the classic Superman theme "Can You Read My Mind?," accompanied by a pianist she brought along even though the party had its own set of musicians. Still, the evening's center of attention was Armida, dressed in a baro't saya ensemble by designer Patis Tesoro, making the rounds of the party supported by her striped cane, and easily spotted among the crowd because of her gleaming signature-white coiffure. Throughout the five-hour party, photographs of the celebrator flashed on a huge video screen near the stage, select images from her travels, her days as a young singer, and star of her own award-winning musicale Aawitan Kita. The entire night, she was followed by a female aide also dressed in a baro't saya, and watched over constantly by her husband of 58 years, Leonardo "Sig" Siguion-Reyna. Asked what the secret is to their long unbreakable union, Sig told PEP: "Just say yes all the time." Put together by her daughter Monique Villonco, editor of Town & Country magazine, the party was a tribute to Armida, the stage performer. The venue, which is owned by the family, was transformed into a theater where guests signed their names on a notebook atop a dresser, walked on red-velvety carpet, and entered the party from a holding area. The evening's well-wishers were a mix of family, friends, and colleagues from showbiz and politics. Special song numbers were performed by Bayang Barrios, Armida's granddaughter Cris Villonco, and select performers from Aawitan Kita's heyday, including Bimbo Cerrudo and Richard Reynoso. But it was Jon Santos's impersonation of the birthday lady, which opened the programme, that brought the house down. Sporting a white wig and the same outfit as Armida's (although Jon's was made by designer Eric Pineda), he sang a kundimanized version of the youth anthem "Laklak" to the tune of "Magtanim Ay Di Biro." He made potshots at Armida's age. A bit on why Armida was never asked to sing the National Anthem in any of the Pacquiao fights: Jon as Armida said he would even dress in the colors of the Philippine flag. "E, nandun ako nung ginagawa yun, a." He also shared a secret on how to raise an obedient son like director Carlitos Siguion-Reyna (also celebrating his birthday last night), who is currently on break from his teaching job at the New York University Film School in Singapore. The strategy to imposing discipline on the young Carlitos? Jon as Armida revealed: "Basta sinasabi ko sa kanya, 'Carlitos, you behave,'" And in a firm, almost threatening tone, "Aawitan kita!"